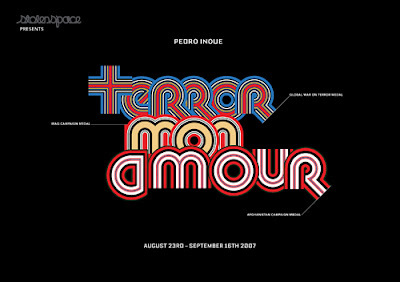 Terror Mon Amour is the first solo show of Pedro Inoue. The exhibition is a vision of an evil paradise of our decadent corporate culture. The works seduce and manipulate with their excess, drawing the viewers attention to its superficial beauty. It sheds light on the power of image today by mimicking the formulas that corporations and governments use to disguise the most horrendous acts of war, torture and terror. Private View Thursday 23rd August, 6.30 - 9.30pm.